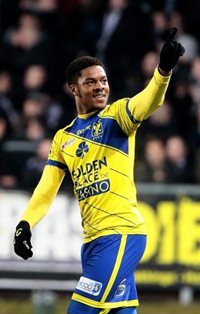 Arsenal loanee Chuba Akpom netted his second goal in the colours of Sint-Truiden as they thrashed Antwerp 4-0 in the Belgian First Division A Europa League playoffs at Stayen on Saturday evening. Against the run of play, the home team took the lead through Samuel Asamoah in the 27th minute. Another African player, Congo DR international Jordan Botaka, handed Sint-Truiden a two-goal advantage in the 64th minute. The one-way traffic continued as Chuba Akpom added a third goal for The Canaries and the day was capped by Botaka's strike on 88 minutes. The Hale End Academy product scored his first goal in Belgian football in Sint-Truiden's 1-0 win over RSC Anderlecht in February. Akpom played just two Cup games for Arsenal before the Premier League club loaned him out to Sint-Truiden for the remainder of the season in the winter transfer market.